The Kauravas were princes of Hastinapur and the sons of Gandhari and Dhritarashtra. Dhritarashtra and Pandu were brothers. Pandu, even though he was younger, was made king because Dhritarashtra was blind. But after his death, Dhritarashtra become the king of Hastinapur. Gandhari wanted a hundred sons, and pleased with her Sage Vyasa granted her a boon that her wish would be fulfilled. But she gave birth to a lump of flesh. Sage vyasa cut this lump into a hundred and one pieces, and they developed into a hundred boys and one girl. They were called the Kauravas. 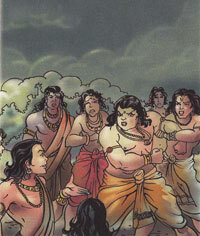 The eldest was Duryodhana and the second brother was Dusshasan. The kauravas were jealous of the Pandavas, the sons of Pandu, and were always fighting with them .